■ If the stone is not impacted and of a large size, which is the typical scenario, the stone is removed intact using a 10 mm right-angled or Babcock forceps. ■ If the stone is impacted, a 5 mm right-angled dissector is employed to free the stone from the posterior wall of the renal pelvis. Then the anterior surface of the stone is freed from the renal pelvis after gently lifting it up at its lower end. The stone is then elevated and rotated to extract it from the pelvi-calyceal system. Sometimes, an intrarenal calyceal extension of the stone may prevent the stone removal. In this situation, the cautery J-hook can be used to drag the stone down and subsequently twist, rotate, and angulate it to disengage from the calyceal opening. If the stone still cannot be extracted, an infundibulotomy is created with the J-hook electrode to release the stone. If the pelvis is of large size and the stone is not seen, or if the stone is located near the calyx, laparoscopic inspection after retraction of renal pelvis, exploration with right angle forceps, and flushing with saline may be of help. If the stone gets migrated proximally into a calyx or if there are preexisting stones in the calyces, a flexible nephroscope, cystoscope, or ureteroscope may be inserted through a laparoscopic trocar to remove these calculi under direct vision. 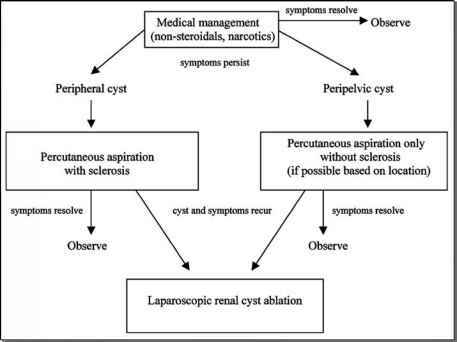 It is not unusual to have excessive peripelvic inflammation, adhesions, and fibrosis leading to difficulty in dissecting the ureter or renal pelvis, especially in patients who have undergone multiple extracorporeal shock wave lithotripsy sessions. In such situations, fluoroscopy or intraoperative laparoscopic ultrasound may be helpful in locating the stone.